Copyright © 1992 American Geophysical Union. The evolution of the Indian Ocean (Figure 1) since the Late Jurassic can be summarized in three main periods of seafloor spreading separated by two major plate boundary reorganizations [Royer, 1992]. 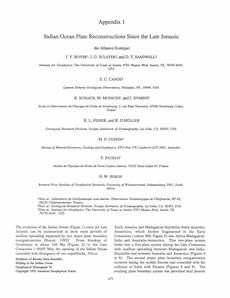 From breakup of Gondwana at about 160 Ma (Figure 2) to the Late Cretaceous (-90/95 Ma), the opening of the Indian Ocean coincided with divergence of two superblocks, Africa-South America and Madagascar-Seychelles-India-Australia-Antarctica, which further fragmented in the Early Cretaceous (¡­chron M0; Figure 3) into Africa-Madagascar-India and Australia-Antarctica. This two-plate system broke into a five-plate system during the Late Cretaceous with seafloor spreading between Madagascar and India-Seychelles and between Australia and Antarctica (Figures 4 to 8). The second major plate boundary reorganization occurred during the middle Eocene and coincided with the collision of India with Eurasia (Figures 8 and 9). The resulting plate boundary system has prevailed until present (Figures 8 to 12, and 1). The final events of this last phase were opening of the Gulf of Aden at about Chron 5 (10 Ma) and onset of the intraplate deformation in the Central Indian Basin between India and Australia (¡­7 Ma). Evolution of the plate geometry is summarized in Figure 13.